Cycling CK55 miles, 10°C, rain wind SW.
That was quite good, despite the wind and rain. Legs felt good, tendon pain was not noticeable. I am working on re-building symmetrical strength. 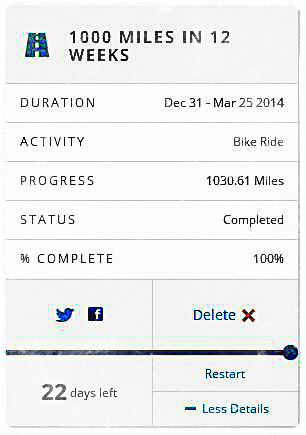 That 1,000th mile was near Ibstock, in Leics. It was then that the rain started. This entry was posted in Cycling, Weather and tagged first thousand, rain wind SW, Sunday ride. Bookmark the permalink.